In slower economical times, people often look for more affordable ways to spend time with each other and relieve stress. The Stampin' Up! opportunity can provide what they need, plus an enjoyable and flexible way to earn money. The Three Easy Payments option helps out even more by allowing potential recruits to spread out the up-front cost of starting their Stampin' Up! business across three affordable payments. If they earn enough during their first two months as a demonstrator, their Starter Kit cost can even pay for itself! The 3 Easy Payment Plan! Fabulous idea if you ask me, since we are all feeling the crunch of the lovely economic times and REALLY NEED our discount on our stamping supplies!!! Start by printing the order form and customize your started kit. Contact Me -paperwork must be mailed to Stampin' Up!. You cannot join online if you want to take advantage of the payment plan. Do I look like I'm having fun??? I LOVE this job! I would love to have you join my Inking Everything Team! Nicholas had this little box of candy and the whole time he was eating it I was thinking that would make a really cute box for Easter. It took him 2 days to finish munching on them before I could swipe the box! I felt like I was stalking my own kid!! I opened the box and traced it for a pattern onto Barely Banana cardstock then added a few finishing touches with the Cheap Talk set and the Sale-a-bration DSP. Paulina's Brownie Pops per your request! I always fascinated about the e-mail I receive. The Brownie Pops were the hot topic since I posted it last week. After 61 e-mails, I contacted Paulina and told her her fans were demanding details...Here you go! Decorate by dipping the flat part of the brownies in chocolate candy melts, rolled in sprinkles or nuts and set them on wax paper. Using a BBQ skewer to poke a hole on top about ¾ thru the brownie then immediately insert the lollipop stick. Refrigerate for 15 minutes for chocolate and sprinkle to harden and settle-in. Bag brownies immediately to avoid dryness. Here come the fun part…Use SU products to pimp-up brownie pops and you’ll be the HERO at any gathering. They are not only yummy but super cuties. Enjoy! Useful Hints: The process is time consuming, if you need more than 8 pops, get more molds or plan for more than 1 ½ hours per mold before even decorating. Mold can be purchased at Michael’s or Jo-Ann Fabric. Wilton.com is sold out. Good luck!!! For those who love the brownie pops idea, but don't want to spend the $10 for a mold, I made some using a mini muffin pan. It took about 18 minutes for them to cook in my oven. What a lot of fun they are to make! Love your box - it made me laug thinking of you stalking your own son!! 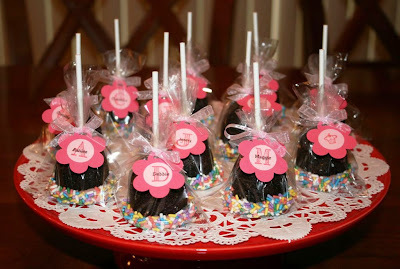 Those Brownie Pops look fab - such a great idea! Thanx for getting the recipe for us. Thank you for sharing this. My son's birthday is on the 10th and he wanted brownies with blue icing and star shaped sprinkles. This will be perfect for 4 and 5 year olds. Thank you, thank you, thank you! Oh my goodness that little box is so cute, everything to make is so cute. Please, please share the pattern with us. I have an easter swap with 3 gals and would love to make them one. great box. stalking your son . . . too funny. You have done it again. This is too cute of a box. Your staory about stalking you son sounds like something I'ld do. Now I"ve got to go to Wal-mart and see if I can find one of this boxes! The brownie bites are too cute too! Becky, you never cease to amaze me! That Easter box is AMAZING! So stinkin' CUTE! Yum! Those brownie pops are awesome! WOW too cute. Please share your idea. I willing to pay 3.95 for the easter box. Love your ideas they are great and thank you for sharing with us!!! I love that little box! SO cute! 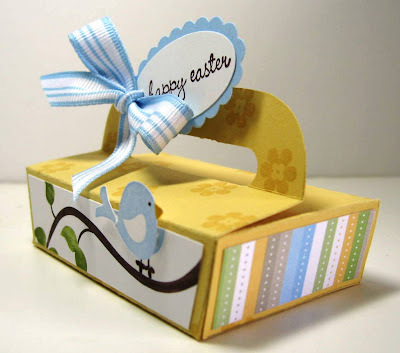 How cute is that box, I would love a copy of the template if you are sharing. thanks, you have the best ideas. Great Blog, I agree with you.Please keep www.myeasypayment.com at your good work, I would come back often. A Milk Carton Container of My Own!